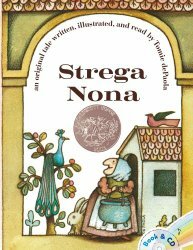 When I reflect on the picture books we shared with our young sons, Strega Nona is one that I recall with special affection. It is a story that can be enjoyed by a wide range of children (and their adult caregivers). Preschoolers who are accustomed to hearing stories read aloud will enjoy the humor, kindergarten-age and primary grade students will also be engaged by the matronly and generous “Grandma Witch” and her well-meaning but accident-prone assistant. Strega Nona was getting old, and she needed someone to help her keep her little house and garden, so she put up a sign in the town square. And Big Anthony, who didn’t pay attention, went to see her. 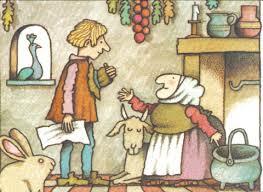 “Anthony,” said Strega Nona, “you must sweep the house and wash the dishes. You must weed the garden and pick the vegetables. You must feed the goat and milk her. And you must fetch the water…. Adapted from Sweet Porridge (also known as The Magic Porridge Pot), children who are familiar with foreshadowing will correctly predict Big Anthony’s ‘mistake’ and will relish the problem he creates and Strega Nona’s fitting solution to it. Highly recommended for children aged four years and up. Follow Storytime Standouts’s board Strega Nona an old tale retold and illustrated by Tomie de Paola on Pinterest. Young Yankel is a storyteller. He overhears bits of news at his father’s store and excitedly shares the gossip throughout the village. One day a wise rabbi gives Yankel a job; he is to put one feather on each doorstep in the village. Puzzled, Yankel willingly distributes the feathers even as gusts of wind send some flying. When the rabbi subsequently asks Yankel to collect all the feathers and return them to the sack, Yankel comes to understand the danger of gossip. 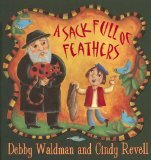 A delightful folktale is retold in A Sack Full of Feathers with engaging illustrations and warmth. Imagine, a refreshing and surprising story told in just twelve sentences! Engaging illustrations introduce a cat, a dog and a trio of mice. Together, they take on a tricky job and discover they are ‘up’ to the challenge. Good fun.